The Personal Pitcher Pitching Machine comes in two models. 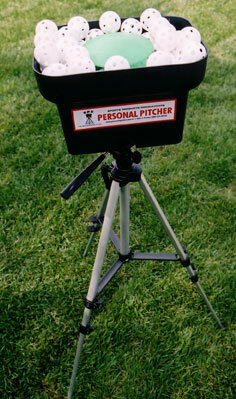 The Standard Personal Pitcher Pitching Machine has speeds of 20, 35, 45 and 55 mph. It holds 100 balls and comes with 2 dozen balls and a 1 year warranty. The Personal Pitcher is ultra lite and very portable. It was designed to improve hand eye coordination, timing and bat speed. The Pro Personal Pitcher Pitching Machine has all the features of the Standard Personal Pitcher Pitching Machine but includes 4 dozen balls and a two year warranty. 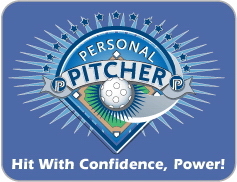 The Pro Personal Pitcher also offers curve balls and sliders for left and right hand batting. Pitch Isolation Training is also included which helps the player to focus on a certain area of their game. Any purchase which includes a PRO Model allows you to use PIT. Commonly used in the ML, PIT is a technique using a pitching machine (or pitcher) to throw nothing to a batter except one type of pitch...Pitch Isolation..., so that the batter can concentrate on the mechanics, including bat angle and point of contact, needed to create a positive result, NOT a strikeout! This forces the competition to use other pitches as an "out" pitch, which increases the batter's likelihood for success. With the technology provided in the PRO...its ability to throw consistently accurate curveballs, fastballs and sliders...the PTS package specifically, YOUR son or daughter can practice JUST LIKE the PROS, and reach the next level more quickly! Proper selection of your GroBat length is important so that it may be used for the maximum number of years by your oldest child. The size you order depends upon the child's growth rate. Improve Your Hitting with the Bat that Grows with You! •The HitMaster GroBat is a small diameter bat designed to be used only with the Personal Pitcher practice golf balls. It features a moveable Sweetspot Simulator pad that tells the batter that he/she is using the correct area on the bat, the "sweetspot." Since this area is smaller than that of a regular bat, the hand-eye coordination and confidence of the batter improve dramatically! •Unlike other bats, the HitMaster GroBat can easily be modified in both length and weight, and comes equipped with a moveable choke-up collar and a set of weights from 2 to 9 ounces. This allows it to mimic any bat, from 28"/19 oz. to 34"/31 oz. and anything in between. This unique ability to change the weight and length of the HitMaster GroBat makes it available to be used by multiple players of different ages and heights, or by one player who is growing quickly! •These features allow the HitMaster GroBat to be used as a lightweight "stick" to develop quick speed through the zone, or it can be over-loaded to develop and stretch the large muscle groups as well as strengthen the hands and wrists. This type of practice should be between 20 to 30 percent of your practice regimen. The rest of the time, use your GroBat with the same weight and length as your game bat. •Practicing with the HitMaster GroBat optimizes the most important aspects of your hitting game...bat speed, power, and hand-eye coordination! The new Focus Ball (Pat. Pend.) brings a new challenge to hitting practice in two ways! Picture it! What a challenge for any batter! •The first is for the batter to identify the color as soon as possible and even verbalize it. Just this simple act has been shown to improve the batter's ability to pick up the pitch early, and to follow it during its trajectory to the plate. Obviously, the hand-eye coordination will be improved as the eyes continue to "focus" on the Focus Ball. •The second feature is the fact that the aerodynamics of the Focus Ball is less predictable than the non-modified ball. The Focus Ball can have late movement, depending on the spin and orientation as it leaves the machine, further forcing the batter to "stay back" and shorten his/her swing, even to just make contact out of the strike zone, and stay alive. Add a dozen to your order and you will "see" the difference! Maximum 2 dozen per order during our introductory phase!